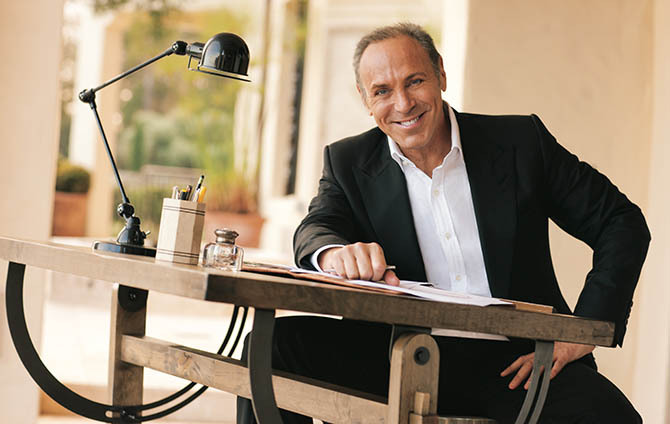 Neil Lane may have become a household name by helping the lovestruck chose the right engagement ring on The Bachelor, but years before that he was known as a vintage jewelry expert. The charismatic designer has been treasure hunting for over a quarter century. Almost from the moment he opened his first retail operation in Los Angeles, the native New Yorker’s curated collection of vintage designs attracted Hollywood’s A-list. 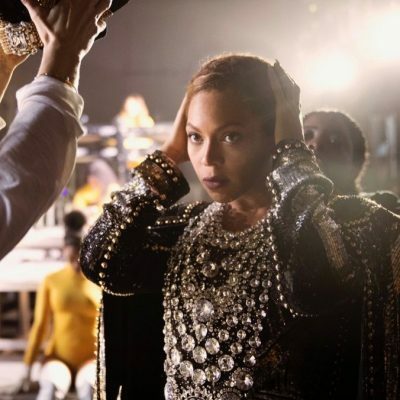 Countless actresses have worn his pieces on the red carpet from Madonna, Jennifer Lawrence and Nicole Kidman to Kate Hudson, Jennifer Garner and Jennifer Hudson. Some of his vintage jewels have even made an appearance on the big screen. Last year his pieces appeared in two movies. Longtime client Warren Beatty asked him for a special ring for his film Rules Don’t Apply. One of Neil’s bracelets was among Amy Adams chic jewels in the Tom Ford feature Nocturnal Animals. Of course, he has also helped countless celebrity couples find the right engagement ring. Above and beyond the glittering Hollywood credentials, Neil’s vintage jewels have appeared in any number of museum exhibitions. In The Jazz Age: American Style in the 1920s exhibit at the Cooper Hewitt Museum in New York, there are an astonishing 18 items from Neil’s Archive Collection of vintage. 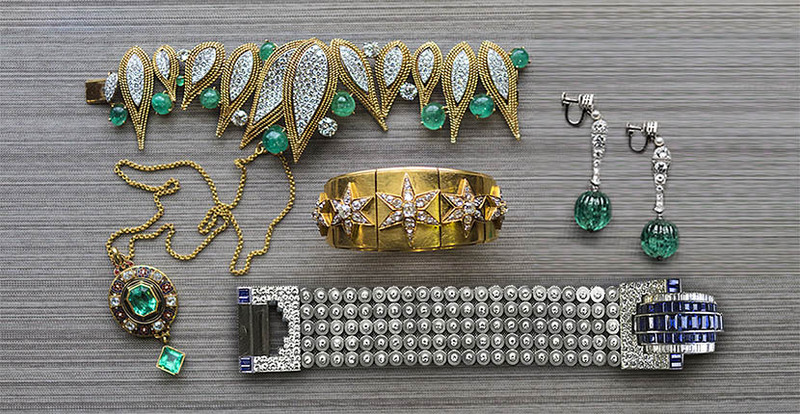 A couple of jewels belonged to Hollywood stars Zsa Zsa Gabor and Mae West. When I visited Neil at his beautiful boutique in Los Angeles to look over some of the pieces in his Archive Collection (that’s code for not for sale), it was almost impossible for either one of us to narrow down the impressive selection into a highlights story. So, what we did was chose a variety of jewels with stories above and beyond the designs. They are anecdotes that reflect Neil’s passion for jewelry and obsession with historical details. Before we dive into the jewels, can you tell me about the collection overall? The period I most covet in jewelry begins around 1875 and goes to 1940. That stretch of time is when you will find the most beautiful jewelry made in thousands of years. Most crown jewels are expressions of wealth and power. They are meant to be jewels that say, ‘I am your queen. I am king—obey me.’ The jewels I love are about design. These carved emerald bead, diamond, natural pearl and platinum pendant earrings by Cartier are divine. They are not over the top, just an ideal art deco design. It’s true. They are exquisite and one of my favorites. With these earrings, I travel the experience of the design. The emeralds came from the Muzo Mines in Columbia. They were carved in India for a maharajah who probably took them to Paris and met with Louis Cartier himself and sold them with a bucket full of emeralds or bartered them for more jewels. 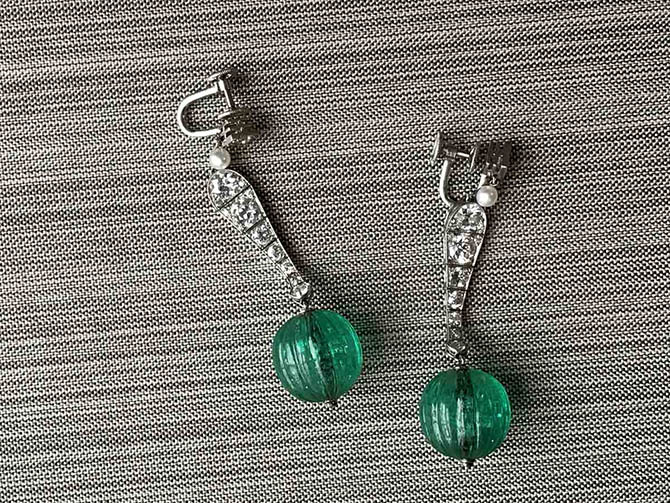 Then Cartier made the emeralds into these earrings. The flexibility and manufacturing of the platinum is exceptional. I adore the fact that they still have the original screw-back on the design. Often those are removed and replaced with posts so they are easier for people to wear today. I sold these earrings 20-years ago and I thought about them every day—every day. Finally, I contacted the woman who I sold them to and asked if I could buy them back. She didn’t really want to sell them back to me, but I finally convinced her. I have a visceral connection to jewelry. I know the value too because that is my job. The financial element certainly heightens the experience, but mainly it is a love of the artistic. There are certain jewels I don’t want to sell. I don’t want to sell them because I am haunted by them. They inspire me in every way. A real jewelry lover’s jewel is your platinum and sapphire bracelet by Verger. Among all your treasures, it really blew me away. 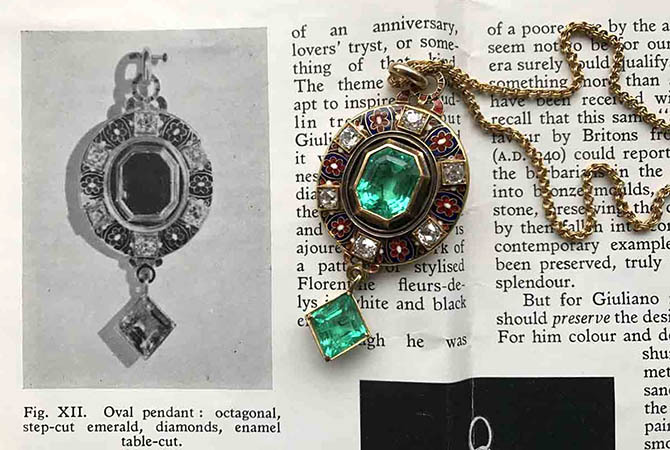 Verger is not necessarily a name everyone knows, but of course they were the manufacturers for Cartier and Van Cleef & Arpels among others during the art deco period. I bought that from the cover of a catalogue. I never saw it in person. I just bought it. You fantasize about seeing jewels like this, but you don’t see jewels like this. It’s refined design. It’s machine style from the 1930s. The cutout in the clasp is a sublime detail. It’s a significant sublime jewel. It seems to me a lot of your joy in this jewelry is the discovery of the details, the research that can be involved in identifying a piece without a signature. Unlike today when everything is so clearly marked, some of the best jewels made by important designers don’t bear a signature. Very early in my career when I was looking around all over Paris for vintage jewels, I learned the unsigned pieces were less expensive and I didn’t have a lot of money so that was appealing to me. As you said a lot of jewelers didn’t sign all their jewelry at that time. I have an instinct about certain pieces that are unsigned. I just feel there is something to the piece that communicates to me. I can see how good it is even though there is not a signature on it. Research is very, very important. When the details of who made a design are identified that’s exciting. For example, a woman brought this necklace in that had belonged to her mother. I liked it because I thought it was Holbeinesque. Yet there was a lightness and an airiness to it. There was a refinement to it. It just was wow. It was so interesting. It couldn’t be made better. The emeralds are so pure. They are just so beautiful. A few weeks after I bought the jewel, the woman came back with a booklet and said, ‘Oh I don’t know is this important to you? When my mother bought it she had this catalogue. It’s a 1954 exhibition.’ It shows the design was by Carlo Giuliano, the master Italian goldsmith who made archeological revival jewelry in London at the end of the nineteenth century. 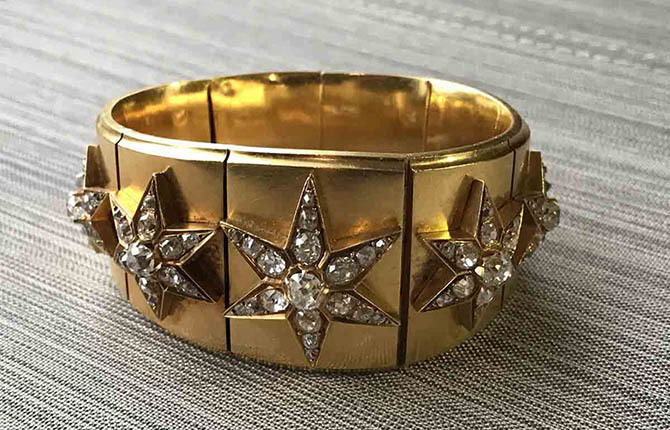 This gold and diamond star bracelet was a similar story. I just knew it was something. The matteness of the gold. The stars resonated with me. It was just a beautiful jewel. Then the thought of Mellerio occurred to me. 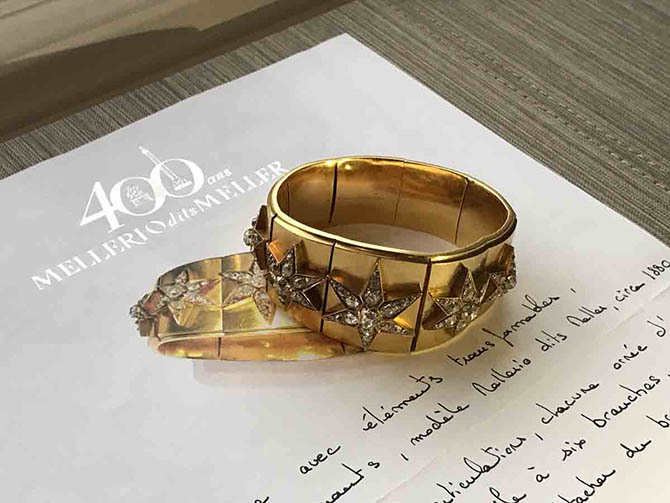 Lo and behold, I sent it off to their archive in Paris and they confirmed that it was a Mellerio design from 1880. We are looking at a variety of jewelry. How do you describe the thread that unites the array of pieces in your Archive Collection? If I had a check list there would be several qualities. Design is first. There has to be a seriousness to the intent of the jewel. The construction has to be incredible. There is also an X Factor. I don’t know what it is. There is something about the sparkle of the jewel that is enticing. Even a child can see the beauty in that, the attraction of the shine. 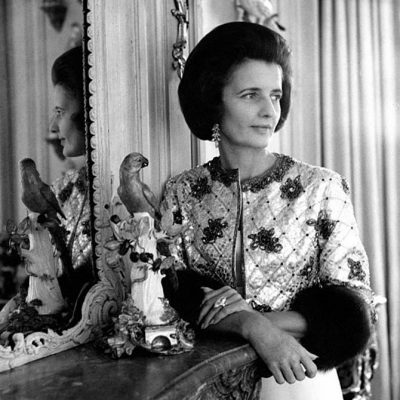 It is the type of glamour that the jewels had in the glory days of Hollywood. It’s all of that. Tell me about one of the jewels that is still a mystery in the collection, one that doesn’t have a signature. There is this bracelet that I call the Jester Bracelet. I found it at an antique show and as soon as I saw it my heart started beating. There is not one mark on it. It fits in the period between 1935 and 1945. The emeralds are unusual. They make it pop. The pavé work is as good as anyone. It’s so glamorous. I could see someone wearing it at the Mocambo Club. The design just unfolds. If I had to guess, I might say it was Sterlé, but it’s bolder than Sterlé. It’s Sterlé on steroids. It could be Flato. It may not be everyone’s cup of tea. It’s not jewelry 101, but it sings and dances to me. I can’t tell you how much I love it.